Patina Moon: Where Bloggers Create II Party! Where Bloggers Create II Party! Hi friends, welcome to my creative space! I hope you are enjoying the party, Where Bloggers Create II so far, I know I am! I can't wait to see everybody's creative niche! So, I hope you'll hang out with me for a bit and take a peek into the nooks and crannies of my room where inspiration begins for me. I love keeping left over fibers on vintage spools. 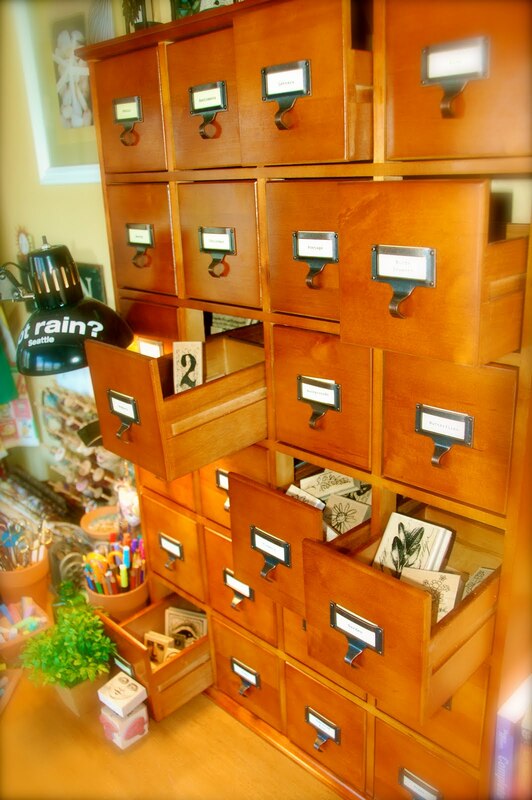 This library card catalogue style cabinet is where I keep my stamps. Fabric? Well, I have a "problem" with fabric, you see I just keep accumulating more and more and no where to store! Help! Oh the quilting bundles and fat quarters make me weak in the knees! More fabric hiding in bins. I like things out where I can see them and they are readily available, so space is a challenge for me. 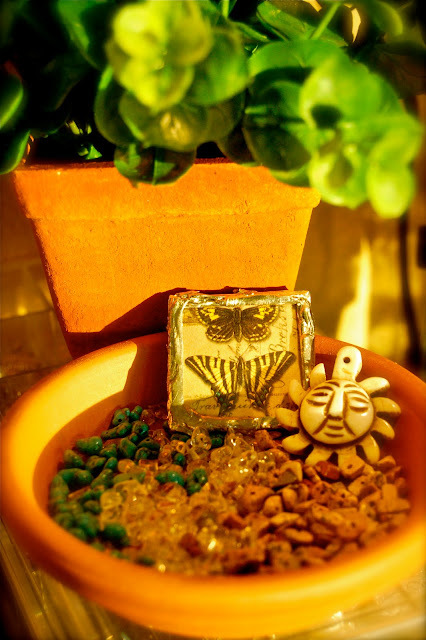 I enjoy bringing the outside in so I use terra cotta pots from the garden, for pens, pastels & chalk. Part of the inspiration, is just being surrounded by my favorite things! 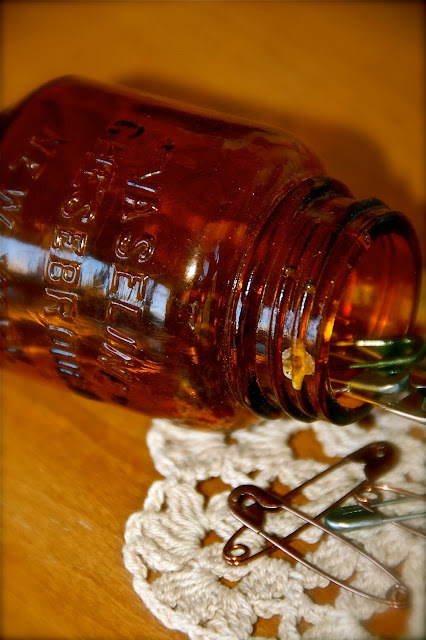 Storing supplies in vintage containers is like eye candy for my creative soul. I love my comfy chair for reading, and I like to burn candles, and even sometimes patchouli oil. I usually always have music on too, even if it's just the ocean or rain nature sounds. 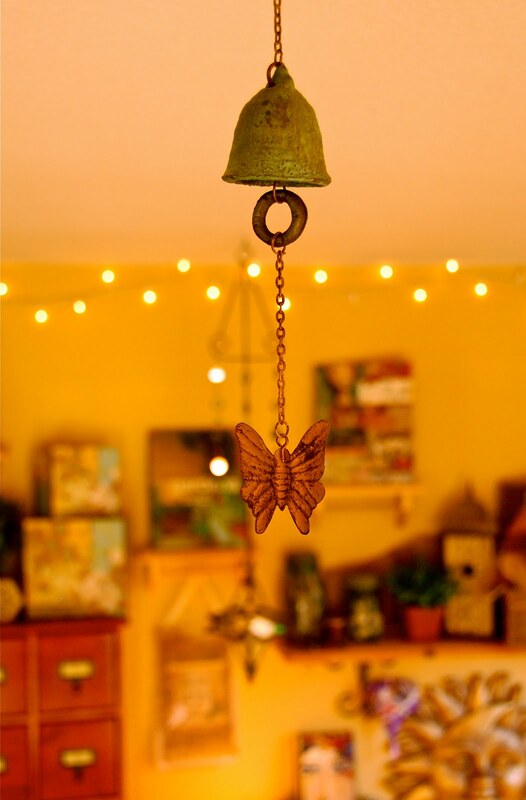 I also love to hang a few interesting things from the ceiling. Cozy surroundings for blogging or taking a nap. 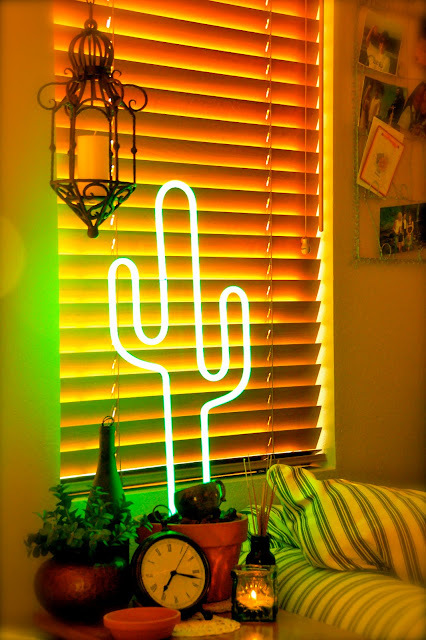 Even though my room leans toward a "coastal" theme, because that's where I hope to live someday, I still use my neon cactus to remind me of the "neon jungle" where I currently live. I love storing some embellishments in an old printer's tray. ...this is his sister, Shatzie, always wanting to be in the middle of any project. 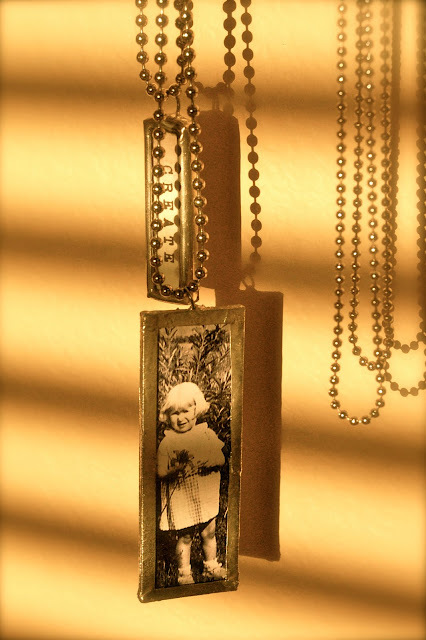 I keep this soldered charm I made with a photo of my Mother near my sewing machine for inspiration. Finally, "my chair" with the burlap covered pillow I made. 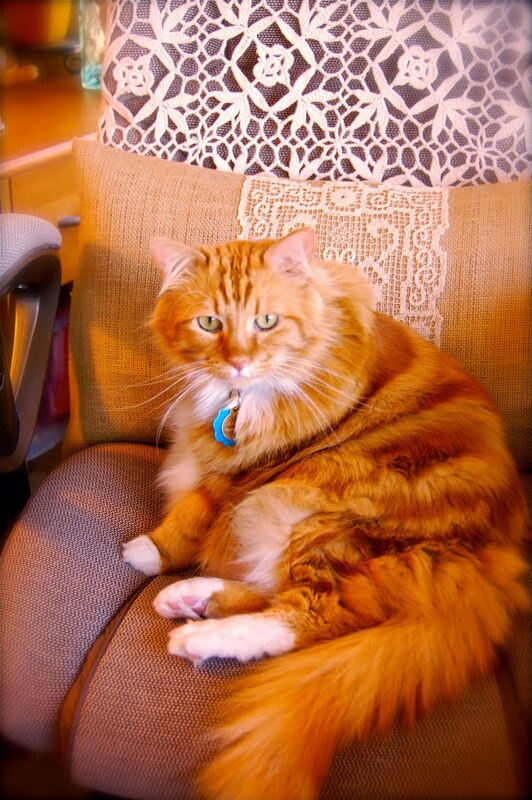 Well, at least it's my chair when Shatzie isn't using it. Thank you for visiting and letting me show you my creative space! Have fun at the party, and I'll be seeing you there! This is a great space Becca! Those art critics are something aren't they? I like the idea of double duty on your room - art space/guest room. Thanks for visiting and commenting on my space. Bec, I just Love all your pictures.. Your room Look Fabulous, I should have let you come over and take pictures of my room for my blog, I don't have that eye for seeing things like you do! LOOKS WONDERFUL! What a wonderful post. I'll have to do another photo shoot of mine. I want you to know that some of the pieces from your giveaway look PERFECT in our newly painted bedroom! The little embroidered pillow and tag are on my bureau. I like your new background on your blog,(it is new isn't it? I've been a touch blog crossed this week, commenting on the wrong blogs!) I have seen lots of new ones this week. Time to change mine too I think. It looks just as I would have imagined. So very you. Only you could make a neon cactus seem romantic and glowy, though. hehe I love everything about your comfy, inspirational place. I can almost smell the patchouli. I love it...if I could wear it as parfume, I would. Your photos are just gorgeous and I just LOVE your "little" space!!!! Hi Becca~ I turned on your classical guitar music and felt like I was right there with you! Your space is lovely and lets me get to know you more~ there are even a few suns in there :) It looks like such a relaxing creative space! I'm afraid I can't share mine this year, we needed my studio temporarily for a bedroom again, so my stuff is everywhere...but you do what you gotta do LOL! Thanks so much for sharing with us! Becca! Yes!! I love your space! This room is full of inspiration! When I dove in...I absolutely loved it! Yes! Beautiful Becca! YES!! Thanks for commenting on my space too! Smiles! you take some great photos. The warmth of the room really comes through. And yours space is lovely. Oh, your space is truly amazing. 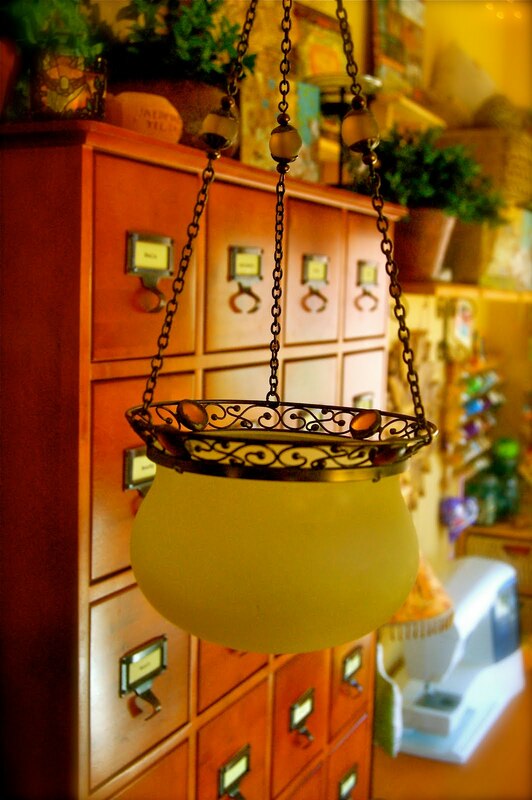 I have been eyeing Library card catalogs at our Antique markets here in New England. I love everything here on your blog. So nice to meet you, and great music, by the way. These photos show your creative space off wonderfully. 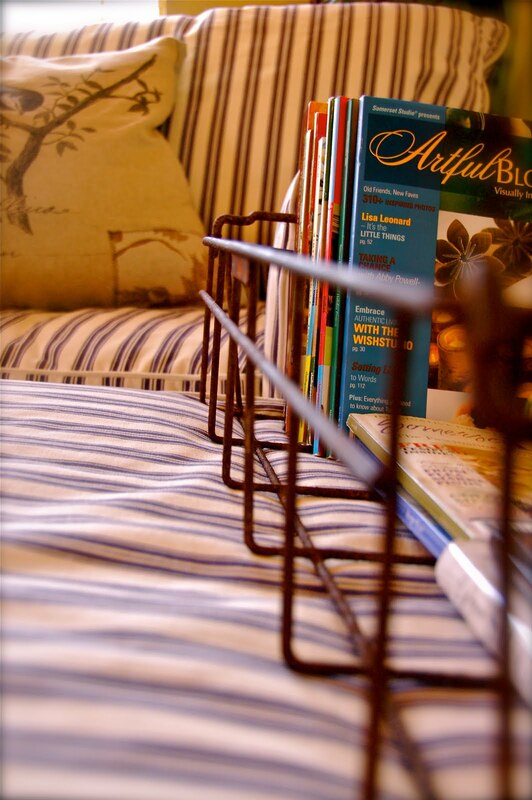 You've got some awesome storage ideas. Thanks for sharing your creative space. 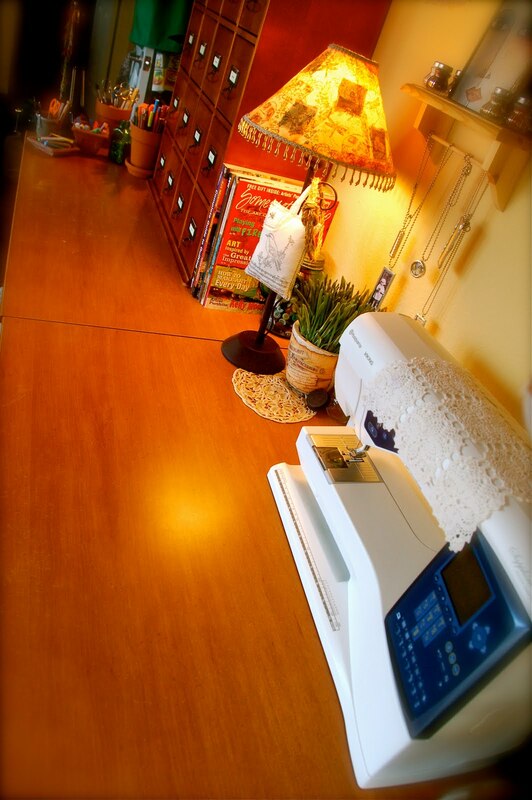 Oh yes ~ truly a beautiful crafty space! Love it! I totally understand about sitting in the middle of all your crafty treasures and getting inspired. 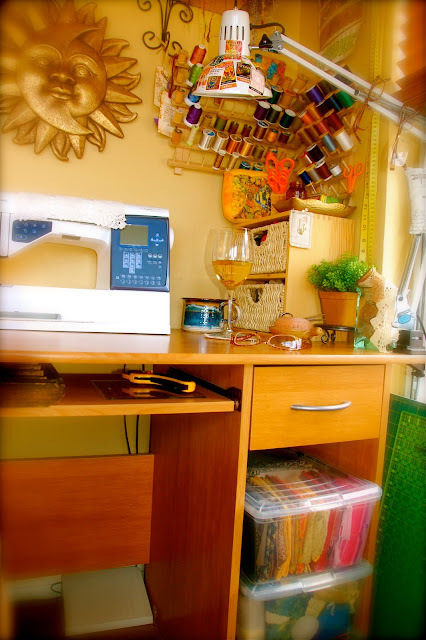 My craft room is like that to me too. The colors, the textures, the visuals, it fuels the creativity. 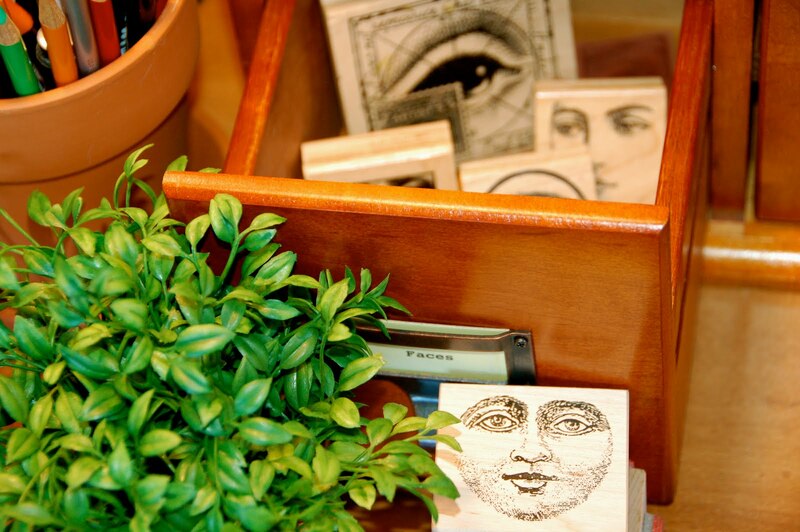 Your photos are fantastic ~ I love your card catalogue cabinet full of stamps ~ so wonderful! Have a Happy Creative Weekend Becca! I am reminded of a little story told by Lucy Lippard, she said she went o interview the "artist" and after leaving his "studio" the wife asked them into the house for coffee, and Lucy discovered the wife created things in a small space in her kitchen. It was her "studio." Sometimes our studios are small, but they are still our studios. Our sacred place. You can call your space your studio, and you can call yourself an "artist." Years ago when I was teaching I used to ask my students to introduce themselves as "Hi, Im ___________ and I'm an artist." I wanted them to hear themselves say it out loud and and in public. For the most part, women don't lie....therefore, it was up to them to find out what an artist is, and what an artist does. And fulfill that role. I see you have a beautiful studio and you say you want to be an artist. Now you have permission to "be." I loved your site, and thanks for visiting mine. I will come again! I was thinking, it is the artist who creates. Not the other way around. Becca, your room is so charming - I can see how it is an inspiration for you. I have been wishing for a library cataloge for years but no luck yet. I will borrow your idea for the vintage spools though - they look so cute and I do have a handful of those I would'nt want to part with! I love how colourful your room is and the idea of bringing the outside in. What a kindred spirit you are! Love your cozy space,lights candles, music and could not help but notice a good glass of wine! A setting for a perfect evening!Thanks ofr visiting my little world too! Oh how I would love to stay in your "guest room"...Sleep would be the last thing on my mind. While it is peaceful and serene looking, there is just so much fun stuff to play with...I am a new follower and can't wait to see your art! Thanks for leaving me such a nice comment on my blog. LOVE your creative space!! Lucky are your guests who get to soak up the vibe of that space!! Thank you for sharing!! Great photos of a great space! You are a very creative woman with a cool kitty! Thanks for giving us a glimpse into your studio and life! Come by and visit me! Hi Becca, good to meet you here! (hopefully to meet you in person soon now that I've moved to Las Vegas). Thanks for sharing your space with us, it is amazing! When Linda knew that I am moving to Las Vegas, she told me about you and give me the link to you blog, I saw some of your beautiful photos with all those blue bottles, I was really impressed by how beautiful those pictures look, now that I live closer to you, we really need to get together sometime soon! Thanks for stopping by my blog to say Hello! Your creative space is magical! I love the earthy organic feel to all the storage with the wood, baskets and terra cotta pots. 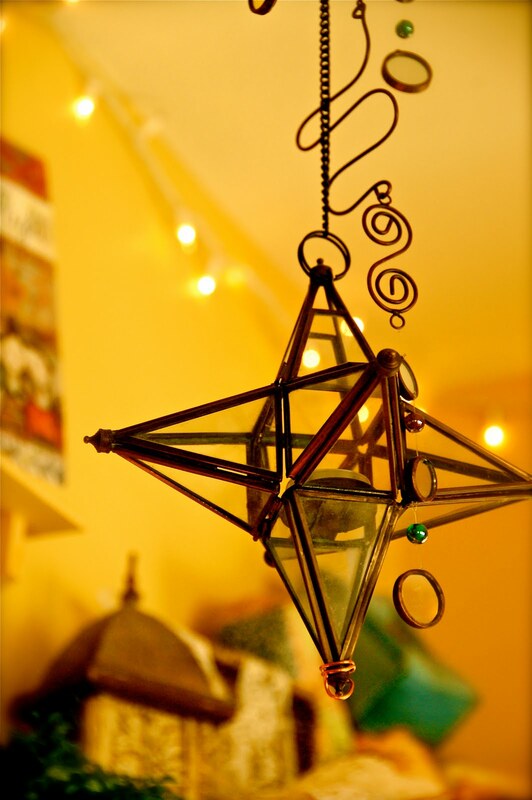 I love the star that hangs, and the printers draw full of little bits and pieces. And I love that your cats are welcome in there. Oh wow! Your place is stunning! It's so tidy but also so warm and cosy. It's got a really really nice feel about it. It oozes charm! That is a really nice cozy space. I love your creative use of storage.My favorite is the library cabinets...what a great idea and how lucky to are to find them! 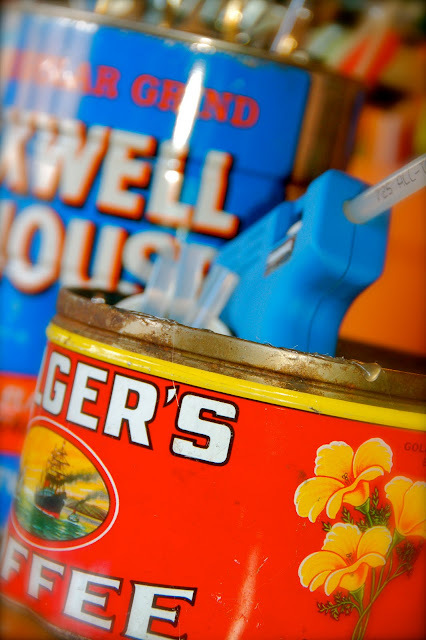 The coffee cans and the old thread holder, things like that which help to keep things in sight but are decorative. I love the little lights...they really go a long ways toward making things seem fun and magical...I may borrow that! Some day, come and take a peek at my daughter and my blog. It is three months old and not really just about my jewelry. I love paper crafting...she loves a million other things like vintage fashion. We were not in any shape to photograph but I am loving the tours. What a little piece of heaven you have created for your creative space. Love looking at all your treasures. So, enjoyed my visit with you. Enjoy the rest of the party. Have you noticed your cats totally match your decor? Your colours are so warm and inviting! Your space is great! Love your trims and your photos are FABULOUS! What a wonderfully creative space! I adore your storage solutions. They have inspired me. Oh Becca, what a beautiful post. I feel like I got to know you a bit better. I have the same problem with fabric. And it sounds like we must both have learned to sew from our mothers. Thanks for sharing your creative space. It has a very relaxing feeling. You must want to be there as often as possible. Love your two adorable kitties. I really enjoy your beautiful photos and your music. Wow! what a cool space -- love the little mug with the ribbon/fabric slices spilling out! Thanks for sharing with us!!! Love your creative space!! You take beautiful pictures, I enjoyed looking at your garden too. You space is wonderful - so full of rich wonderful textures - thanks for sharing it with us. Great photos and a sweeeet space. I also have two ginger kitty helpers, brother ans sister. what a wonderful place to create! I love all your treasures and the wonderful ways you store them. The library card cabinet is to die for! We just moved and I lost my sunroom (studio) in the process...so my area is now in a corner of the bedroom just like your room! thanks for the inspiration! What a wonderful creative space you have! Love your fabric colors and I'm impressed with how organize you. Love your recent post of blog party hangover, I'm still trying to visit everyone. 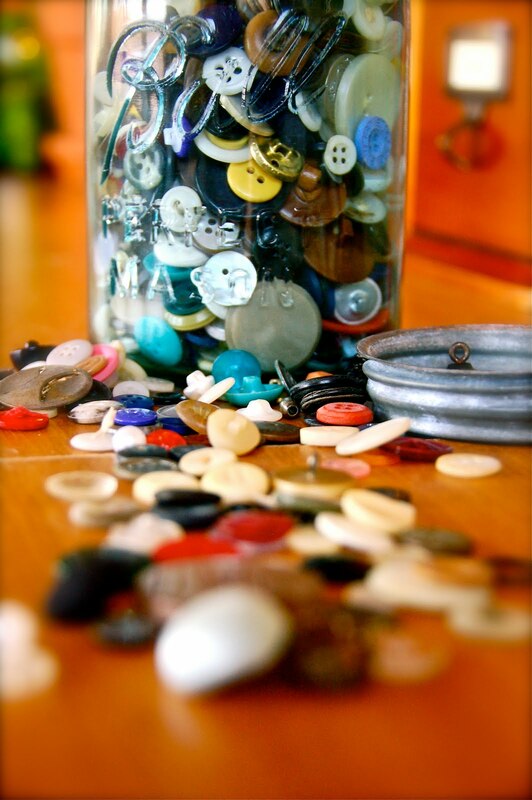 Your vintage spool storage is awesome! I love how you have managed to combine both a studio and a guest room into one very functional space. I'm moving into an apt. in the not-too-distant future and will have to do that same thing. Thanks for the inspiration! So great to meet you! I love your space (especially since you have a wine! ), love your kitty and totally love the picture with your veil blowing in the breeze! Gorgeous! Happy anniversary. I'm following your blog now so I can keep in touch. Beautiful, Becca! Your colors are always so vibrant! What a gorgeous studio space you have (and blog)! Love the library card catalogue cabinet for holding stamps, the bird pillow and wire basket to hold all your favourite magazines & your sweet cat! ♥ I look forward to stopping by again. A beautiful space to the 100th power. And I loved the wood file drawers ...WOW! TFS. Becca you have an awesome place to be creative! When you were yourself out... you can relax in that big comfy bed! 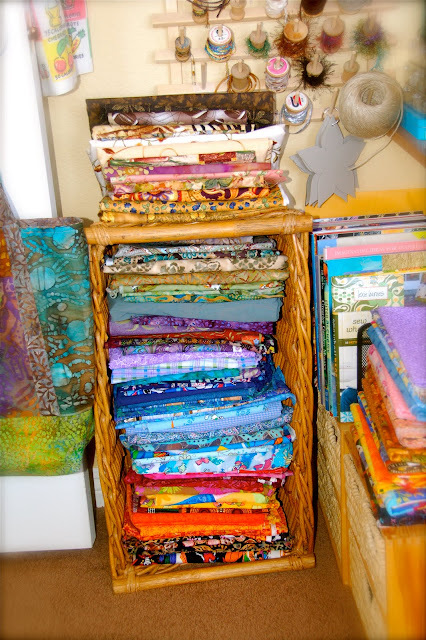 I used to have a total fabric addiction too! Then I switched to paper, but both are so much fun to collect!!! Thank you so much for letting us have a peak!! I love this room. 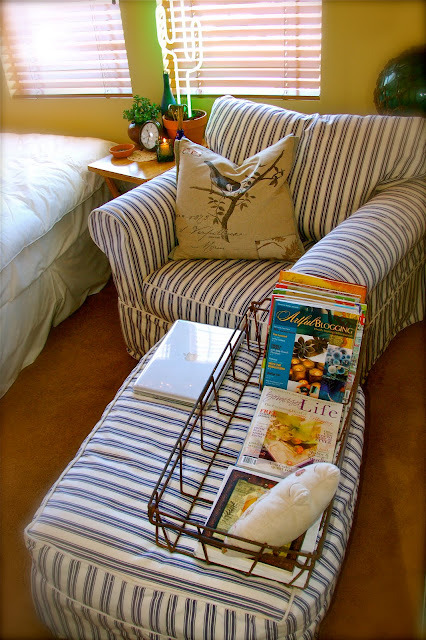 The library card cabinet is great, love the pots for storage, your soldered charm and that burlap pillow. Thanks for sharing, have a happy 4th! The word soothing comes to mind while viewing your space. It is totally inspiring while also being totally relaxing. I love the charm you made with your mother's picture and that green cup overflowing with ribbons - I would so frame a print of that photo - stunning! Loved your little creative haven, thank you for sharing. I love your creative space, the pictures make it feel so inviting. I'm just starting my fabric addiction. so you've given me some ideas for my studio. I enjoyed listening to the music:) Please stop by a check out my studio. That's a nice room. I love it. It looks like a great place not just to work but to relax and dream. Thank You for inviting us in! Your space is wonderful. I love how you have managed to keep a guest bed in there also. I love using tins for storage. I have several. (I'm still going down the list of bloggers). Oh, and you also have books by my favorite company. I love your art space. It is so inspirational and I love the way you photographed all of the fun things you love in your space. It is a serene space. 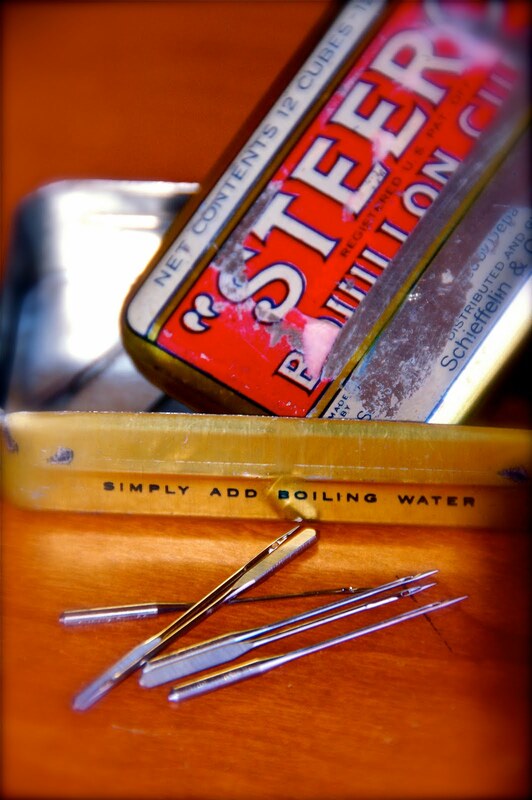 I also loved that you keep the soldered photo of your mother near your sewing machine. How sweet. I have enjoyed this post very much and the music. Becca, your room is beautiful, cheerful and tastefully done. I love how the bright colors of your "creative materials" stand out against the neutral comforter and chair. Your kitty must be great company. Wow I love how you did your space.. it is truly inspirational. Thanks so much for sharing. I came by way of Barb in Mn. I really love your way of displaying. Your blog is so fun. I love your creative space. I love Vintage, Shabby Chic but you truly can display all of it. I laughed when I saw your comment on FABRIC. I thought only my sister and I shared that sickness. What an absolutely delightful room! Love the way you're using it for so many varied purposes AND keeping it organized...think I'll keep this entry in front of me for inspiration, thank you. Hi I'm Becca! 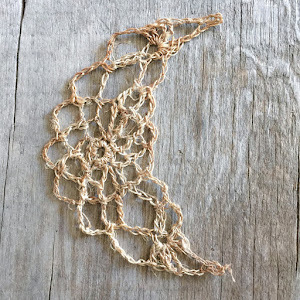 I love photography, crochet, and just about anything else crafty, so quite often you will find the photos I share here are of the things I make. I hope you will find your visit here relaxing and inspiring!